Two local gardeners, Cally Ingram Slager and Cadri Curry, from Monroe and Snohomish, respectively, use manure from Qualco Energy in the Tualco area. As you walk into the greenhouse there’s a bustling scene - people are eagerly planting and transplanting everything from peppers to squash, and surrounding them is a sea of plant starts, resting end-to-end on makeshift tables. In the center of it all is Reverend Jim Eichner. Reverend Jim enjoys instructing and educating those around him on the correct way to transplant seedlings, and how the farm operates. While this might seem like another day on the farm, this isn’t just any farm - it’s Food Bank Farm, a fully volunteer-supported endeavor that donated 180,000 pounds of produce last year with the help of more than 1,400 volunteers. Food Bank Farm is a ministry of The Episcopal Church of the Holy Cross in Redmond. The farm encompasses ten acres and is located at Chinook Farms, which rents space to the church. 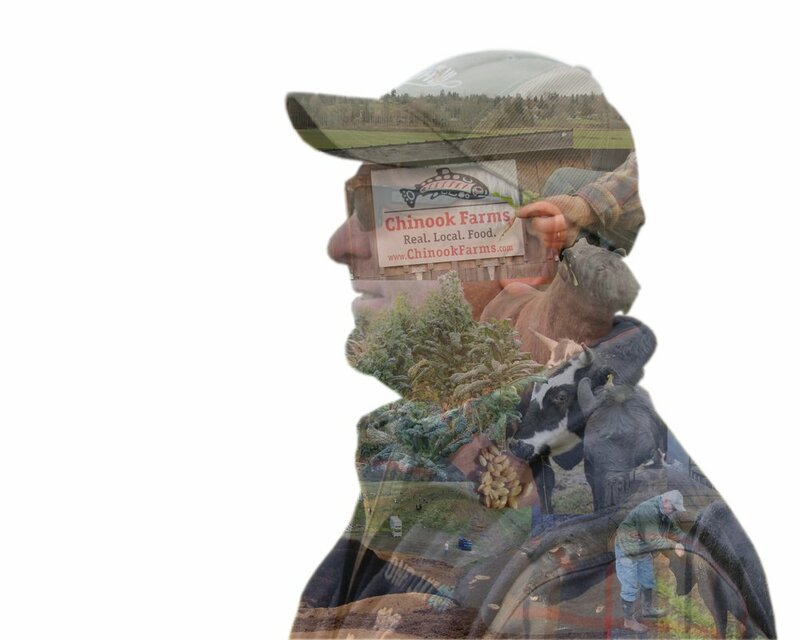 Located in the Snohomish River Valley, Chinook Farms is a community-supported farm on Elliott Road in the Cathcart area. Chinook Farms’ specialty is grass-fed beef, hay, and mentoring new farmers. Owners Sharon and Eric Fritch were recently honored as Conservation Leaders of the Year by Snohomish Conservation District (read more about our award winners here). Church leaders are working to end hunger in the Pacific Northwest by growing fresh produce for area food banks. Washington is the 23rd hungriest state in the nation and 1 in 5 Washingtonians rely on a local food bank. Food banks have always acted as a vital distributor of food, but getting the freshest produce has always been a challenge. That’s where the idea for Food Bank Farm started. Reverend Eichner wanted to ensure that food banks could be given the first pick, rather than what is left over. The District’s Lawns to Lettuce Program and Project Harvest will be hosting a harvesting event at Food Bank Farm later this summer. If you’d like to get involved in that event or bring a volunteer group to the farm, visit snocd.org/food-bank-farm. Founded in 2011 with 12 volunteers, and donated 3,750 pounds of fresh vegetables. In 2018 they estimate 1,500 volunteers, and they hope to donate 200,000 pounds of fresh vegetables. The produce gets delivered to 350 local food banks. The cost per pound of food is under $0.04 because of volunteers. In days past, when one needed fertilizer for a garden or flower beds, they visited the farmer down the road and loaded up! Now, more than likely, it means a trip to a big box store for bags of composted manure trucked in from miles – or states - away. But when you think about the amount of packaging, time and gas required to truck in this resource, it makes sense to try and find more local alternatives. When exploring your options, ask around to see if other gardeners you know have a source of composted manure they’re willing to share. Snohomish Conservation District also maintains a list which can be requested by calling our office. The ‘Manure Share List’ includes people looking for manure, and those with too much that are willing to share. Some farmers will load, others are self-load. Bring a friend with a pickup and share a load! Some farms charge a small fee for their manure or to load it, or may have piles only accessible via 4-wheel drive. You’ve Got It – Now What? Properly composted manure, allowed to go through 120 to 180 days of hot composting, is best, but you can also get fresh manure and compost it yourself. When using fresh manure, allow it to age (i.e. compost) for six months to avoid any potential problems. Keeping your pile moist, and turning it periodically, will speed up the process. Do not use fresh manure on vegetables, especially root crops, due to the potential of transmitting pathogens. Many people spread the manure in their gardens in the fall and rototill it in spring before planting. Incorporate it to a depth of 6 to 8 inches so you can get the full benefit of the compost. Proper use of manure in the garden can help not only supply nutrients, it can also help soil aeration and drainage, which ultimately results in healthier plants. Most manure application is based on nitrogen content and how much is actually available to the plants in the first growing season. However, too much manure can lead to nutrient runoff, excessive vegetative growth and in some cases, salt damage. Salts in fresh manure can be high, especially in poultry manure. Poultry manure is also high in nitrogen and tends to be ‘hot’, which can burn plants. To avoid both salt damage and burning your plants, either compost the manure first or wait 3 to 4 weeks after application to plant the area. Some manure is high in phosphorous as well, so you may want to get a soil test to make sure your phosphorus levels aren’t getting too high. There are many variations of compost – depending on livestock type, bedding used, etc. - but it’s important to know your sources. Ask the farmer if their animals have been recently de-wormed, or if the hay they feed is treated with an herbicide. Some crops are more susceptible to residuals such as potatoes, peas, carrots, lettuce, and tomatoes. Make sure the manure you haul in is from herbivores (sheep, llamas, goats, cattle, and horses) rather than pigs. (Never use cat, dog, or pig manure in vegetable gardens or compost piles. Parasites that may be in these types of manure are more likely to survive and infect people than those in other types of manure). Your composted manure may have bedding mixed in which is fine, it will help improve soil tilth as well. If the compost has not been thoroughly broken down and has a high amount of bedding, it can actually draw nitrogen out of the soil in the composting process, robbing plants of much-needed nitrogen. Horse manure alone has the perfect carbon-nitrogen ratio for composting, although most horse manure is too high in bedding to readily compost. When manure is correctly composted, the finished product is mostly free of odor, flies and some weed seeds, and can be easier to load and haul since it likely has less moisture than fresh manure. The articles in the resource section offer more in-depth information on the use of manure and compost in gardens. Did you know that Snohomish Conservation District has a ‘Manure Share’ List? Call 425-335-5634 and ask for one of our farm planners who can email the list to you and offer suggestions on home use of manure. If you have excess manure to share or want to be on the list receive manure, please let us know and we will update our manure share list. Ready to learn more, take a moment to read about how Cally Ingram Slager and Cadri Curry are helping their gardens thrive with local compost at snocd.org/local-compost-stories. For more information on using manure in the garden, contact your local Extension Master Gardener office or Conservation District. Local food production can mean anything from your own backyard garden to a U-Pick Farm stand, or the acres of grain being produced down the road for livestock feed. Keeping food production local helps reduce the energy costs for transportation, enhances the local economy and supports jobs, and can be a means for neighbors to come together for the greater good of the community. There are several exciting opportunities to participate in growing or harvesting food, even if you don’t have your own plot of land. 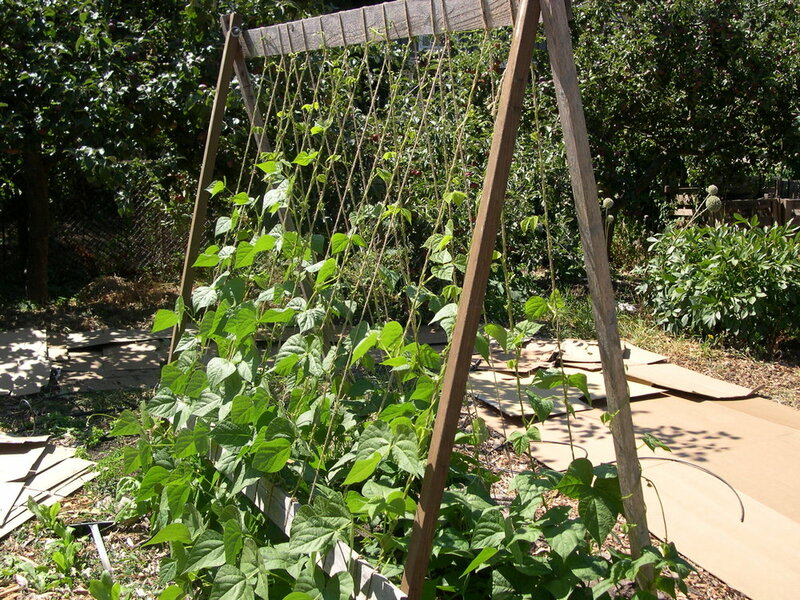 Does your town or city have a community garden? Maybe your local senior center has some garden beds you could assist with. If you are getting ready to plant your own garden, think about adding an extra row just to donate to others or give to the food bank. Do you have extra seeds leftover? Why not share with a friend or participate in a local seed exchange. Gleaning during the summer and fall is another way to not only help your own family, but also to help your community harvest excess crops from willing farmers for those who don’t have access to fresh produce, or who aren’t physically able to harvest their own. Gleaning can be anything from picking up fallen apples in an orchard to hand picking green beans after a mechanical harvester has been through the field. It not only helps the farmer dispose of excess edible food that is too expensive to hand pick, it helps your community by making use of produce that would otherwise go to waste. If you don’t need an entire summer’s worth of produce from your own garden, think about sharing with your neighbors or donate to your local food bank. They are always in need of fresh produce to support their clients. Read on for some other ways that you can help ‘share the bounty’! The District’s Lawns to Lettuce program was developed to help teach people how to create and maintain productive gardens, instead of unproductive lawns. We offer workshops and advice for those making the switch. Learn more at snocd.org/lawns-to-lettuce. Project Harvest aims to increase access to nutritious food in Snohomish County by connecting local farmers, food banks, and volunteers to get fresh, local produce into the hands of the food insecure. A new partnership has developed over the winter between Snohomish Conservation District’s Lawns to Lettuce program, and Volunteers of America’s, Project Harvest. Project Harvest and Snohomish Conservation District will be hosting several gleaning events at local farms throughout the summer. Sign up for the mailing list to stay in the loop for upcoming events and workshops snocd.org/gleaning. Did you know that you can donate your surplus fruit and vegetables to your hungry neighbors through your local food banks? We encourage you to think about adding an extra row to donate to others or give to the food bank. Join our new initiative and pledge to grow a little extra food this season for food for those in need. Take our pledge to stay in the loop about food bank donation hours and drop-off instructions, to ensure that every apple and zucchini makes it into a belly! Take our pledge at snocd.org/plant-a-row. Tilth Alliance’s Puget Sound Fresh Guide is pretty much a one-stop-shop for finding local producers, CSA’s (Consumer-Supported Agriculture) and Farmers Markets. You can also use the app on your phone if you’re traveling or heading to a certain area and you want to stop for strawberries or check out what days markets are held in a new town. Download the app and learn more at pugetsoundfresh.org. Community gardens are a great way to give back to the community and they help stock empty food bank shelves. They bring people together with a common goal and help weave community ties in the process. WSU Extension has a Growing Groceries class series that can help you learn the in’s and out’s of gardening. They also have a list of existing community gardens you can volunteer for. Check it out at snocd.org/garden-list. If you don’t see your community garden on the list, contact the Snohomish County WSU Extension Office, at (425) 338-2400 for further information. Looking for Community Garden Funding? Need help expanding and improving an existing community garden? Apply for a $500 cost-share grant through Snohomish Conservation District’s Lawns to Lettuce program to help your community-based organization grow and flourish. Learn more at snocd.org/funding. 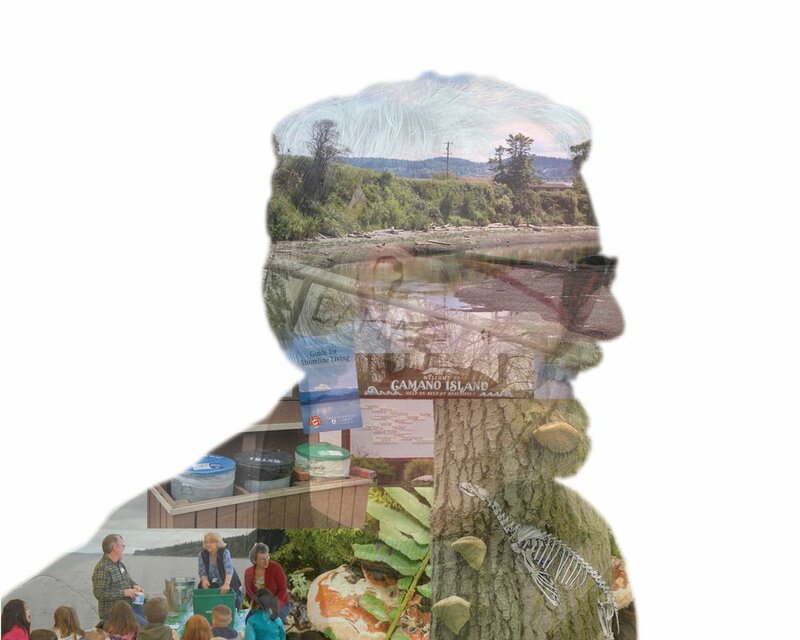 In April we gathered to amplify and celebrate some of Snohomish County and Camano Island’s greatest changemakers, who are shaping our conservation landscape one action at a time. I had the great privilege of interviewing each of our award winners and left every interview feeling inspired by their stories and dedication. Preparing for the interviews and reading through the nomination statements, I found myself looking for the commonalities. These individuals and organizations were amplifying their changes- seeming to double down on their impacts, spreading ripples throughout their communities. Have you ever stopped to wonder how change starts? What I heard most often during my interviews is that it always starts with that first step. At times this step can seem to be nothing out of the ordinary. It could be that you install a rain barrel, start composting, or plant a small container garden. Then, that initial action can easily become the catalyst for something more, as it ripples outward, more varied as we collaborate and share with others. As we empower each other, that initial step can become much more than ever anticipated. I hope you take a moment to read more about these changemakers and are empowered and inspired by them to go out and make ripples in your own community. Read their stories at snocd.org/changemakers. Forested buffers along streams help keep water clean and cool – important for fish, wildlife, and humans, they are the main defense keeping pollution out of our surface waters. Our Working Buffers program allows farmers to widen their forested buffer without losing farmable ground by combining agriculture and trees together. 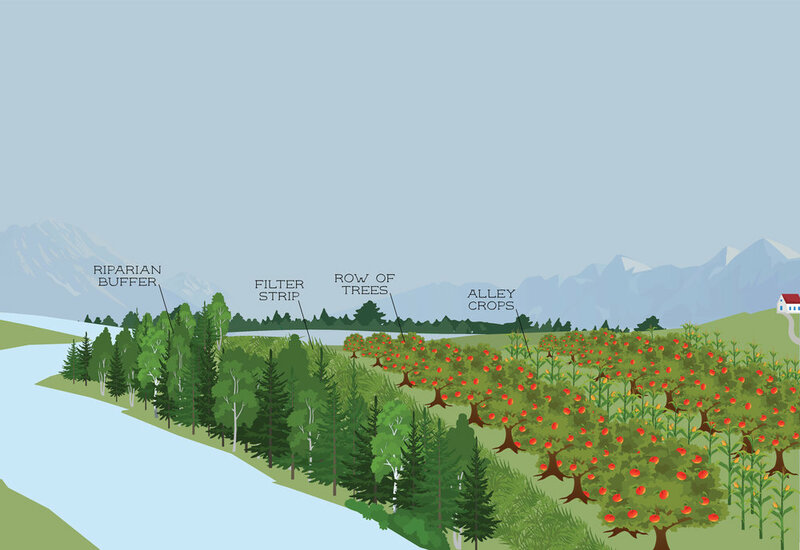 Tree crops such as fruits, nuts, and timber are combined with understory crops such as berries, floral industry greens, mushrooms, and livestock forage. There are four working buffer techniques that may fit the goals of your farm: forest farming, alley cropping, short rotation biomass, and silvopasture. Where to use and how to manage these alternative farming methods is specific to each site’s conditions and each landowner’s goals. It can be difficult to balance on farm land use between functioning riparian buffers and productive ground. Working buffers provide ways to expand a newly planted or existing buffer to increase its functions while at the same time earning more income for your farm. Illustrated below is an example of alley cropping. Alley cropping involves planting herbaceous and usually annual crops in the ‘alleys’ between widely spaced rows of trees. Trees are selected for their productivity potential and synergies with crops. Highly productive tree or shrub species can be managed for fruits, nuts, livestock feed, and timber. ‘Alley crops’ in-between rows can produce hay, small grains, vegetables, ground cover fruits, medicinal herbs and even vines such as berries or grapes. Combining these two production methods can help farmers cope with market fluctuations and crop failures by diversifying outputs and increasing yields. Alley cropping can either be a long- or short-term approach to maximizing farm production while establishing additional forest canopy in a streamside buffer area. Want to see what the other working buffer practices look like? Or have questions about how to get started on your own property, visit snocd.org/working-buffers or call Carrie Brausieck 425-377-7014. What do salmon have to do with agriculture? The simplest answer is that they both utilize the same estuary - the lowland where our rivers meet the sea. Snohomish County boasts two of the most important estuaries in Puget Sound, which have served fish and farm communities for generations. However, these prime areas may face severe risks into the future- with increased flooding due to climate change, salmon decline from polluted runoff, and agricultural pressures from urban development. That is why Snohomish Conservation District participates with local governments, tribes, farmers, and fisheries in the Sustainable Lands Strategy (SLS) to work towards multi-benefit solutions for these complex issues. Through the power of partnership, SLS is changing the conversation between historically opposed groups, to find ‘win-win’ scenarios that meet the diverse needs of stakeholders in the floodplain. Can we have both salmon recovery and a vibrant agricultural economy here in Snohomish County? With a little creativity and elbow grease, we’re finding that just might be possible. Learn more about this unique endeavor at snocd.org/sustainable-lands. In the winter of 2014, David New was seeking ways to build a bridge on his property north of Arlington. He invited Wayne Watne from the Washington Department of Fish and Wildlife out to learn about permitting for a bridge. When Wayne spotted coho salmon in the stream, he suggested David reach out to Snohomish Conservation District to learn what programs were available for Stillaguamish landowners. It turns out that this unnamed tributary of Pilchuck Creek is an important spawning area for coho salmon. Around our office, it is commonly known as Trib 64. David noticed that salmon were getting caught in the weeds of his field. Yes, the field. The reed canary grass, a nasty invasive weed, had grown across the stream, and when at least six inches of water was present, coho salmon would swim over the field. When the water retreated, and due to the increased sediment caused by the reed canary grass, the fish would get stranded and die. This section of stream with impeded fish passage was over 1000 feet long. After this section, though, the waterway was passable for fish once it reached a forested area. Like much rural/agricultural land in Snohomish County, this property had been in David’s wife Dari’s family for a few generations. Her grandfather bought the land from a timber company that used railroad lines to haul the logged trees off-site. When an uncle of Dari’s passed away, she and David hoped to buy the property, but a developer bought it first. As luck would have it, or simply the nature of the world, the recession hit and the developer went out of business. He had proposed 60 homes for the property, the New family bought it instead. The New family’s affinity for fish goes back several years. David recalls the humpy’s (or pinks) from the 2005 run - thousands of them in fact. He said it was an amazing sight to see. In recent years, the numbers have not been near that high so the family hopes with the addition of their habitat project, they will see more fish in the future. For the project, Kristin Marshall, District Senior Habitat Specialist, sought two funding sources - a Washington Department of Ecology (DOE) grant for 6.5 acres and the Conservation Reserve Enhancement Program (CREP) for 26 acres. District Engineer Derek Hann was the main engineer for the project and luckily, David New is an engineer as well, so he provided additional designs as an in-kind contribution. Through CREP, there will be four years of crew maintenance provided to the New family for keeping the reed canary grass down, and there will be check-ins for at least the next decade. Our goals with this project are the long-term health of Pilchuck Creek with the re-establishment of a forest canopy, a vegetated streamside, and by facilitating fish access to spawning areas. The challenges remain the ongoing battle with reed canary grass and the migrating channel. Rivers and streams tend to go where they want - hence this project was based on what was naturally occurring, instead of trying to re-route the waterway. What's the Deal with Reed Canary Grass? Reed canary grass (Phalaris arundinacea) is a noxious weed. Contact the District’s Habitat Team if you are dealing with reed canary grass on your property at habitat@snohomishcd.org or 425-335-5634 to schedule a site visit. It is a major threat to natural wetlands. It out competes most native species as if forms large, single-species stands. Dense stands have little wildlife habitat value. Its invasion can cause siltation in irrigation ditches. Reed canary grass can spread by seeds or by creeping rhizomes. The species will also produce roots and shoots from the nodes of freshly cut stems. As the days grow shorter it’s time to prepare for the dark, wet days of winter. We know the challenges that await us in these winter months: rain, mud, darkness, and cold. The constant, never-ending rainy days can make chores difficult and alter the routines of our horses, but planning ahead can make the winter manageable, and safe, for horses and horse owners alike. Here are our top five tips for winter horsekeeping in the Pacific Northwest. As Westsiders here in Washington, it’s difficult to imagine the threat of a wildfire as we tromp through the rain and mud for close to eight months of the year. But due to our beautiful dry summers, the landscape can dry out quickly, presenting a window of time where a grass or forest fire can pose a serious threat to property and lives. 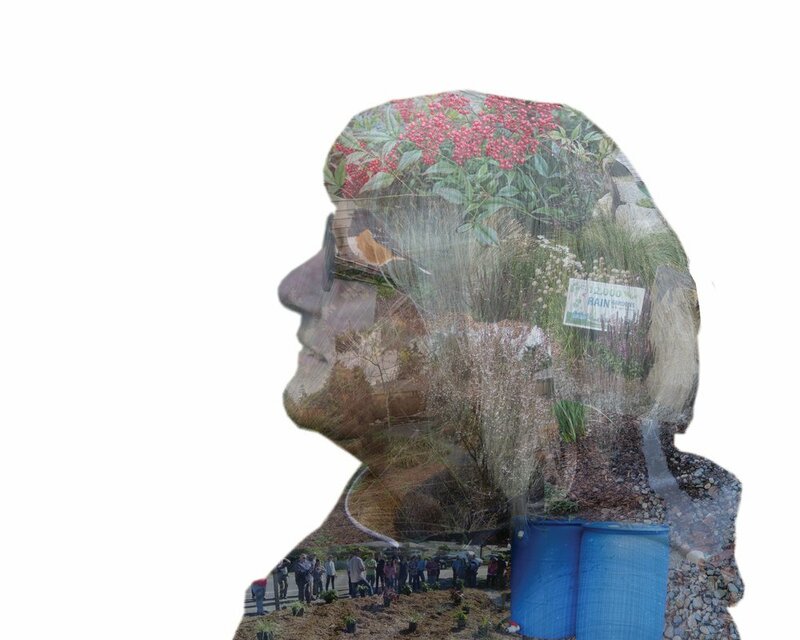 Terry Myer, one of our 2016 Conservation Leaders of the Year, transformed her backyard into an edible, sustainable paradise where she welcomes neighbors and community members to learn first hand how to do the same in their yards. Even the neighborhood cats flock to her yard, as she has a tire planter dedicated to growing catnip. Are you tired of mowing all that grass? Interested in growing your own food, starting a community garden, or providing food to those in need? If you answered yes to any of these questions, our Lawn’s to Lettuce program is here to help. 1. Feed Production: They grow the food that feeds the cows on 1,200 acres of their own cropland and they purchase crops from farmers with another 1,000 acres. Flowers provide the nectar and pollen resources that pollinators feed on. Growing the right flowers, shrubs, and trees with overlapping bloom times will support pollinators from spring through fall.